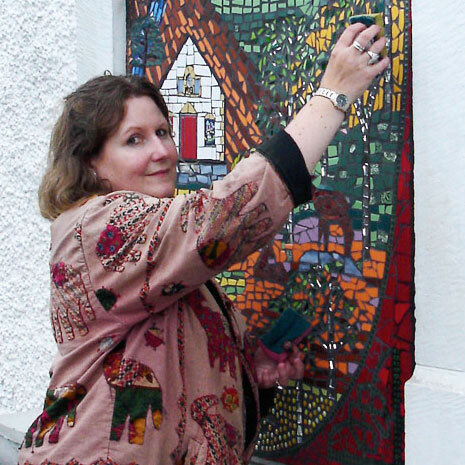 I am a multi-media artist specialising in mosaic. I have a BA (Hons) in the History of Art from Manchester University and PGCE qualifications in Art and Design teaching and Art Therapy from Birmingham. For 13 years I worked in NHS art therapy posts within the fields of mental health and learning disabilities. In 2007 I became self-employed as a registered Art Therapist in private practice and a Community Artist. I enjoyed going back to my early experience of being a community artist and started designing and facilitating workshops that enable participants of all ages and abilities to explore their creativity and develop the confidence to try new skills. Being self-employed has allowed me more time to develop my own art work in paint, mixed-media and mosaic. My family relocated from Pembrokeshire to the Scottish Highlands in 2010 and we are living on the beautiful Black Isle. Increasingly, my love for mosaic has taken a hold and now become the focus of my current practice. It’s a versatile and exciting medium to work in and appeals to my magpie tendencies. I find it completely absorbing and enjoy sharing my passion with others. You can browse the services I offer via the links below.